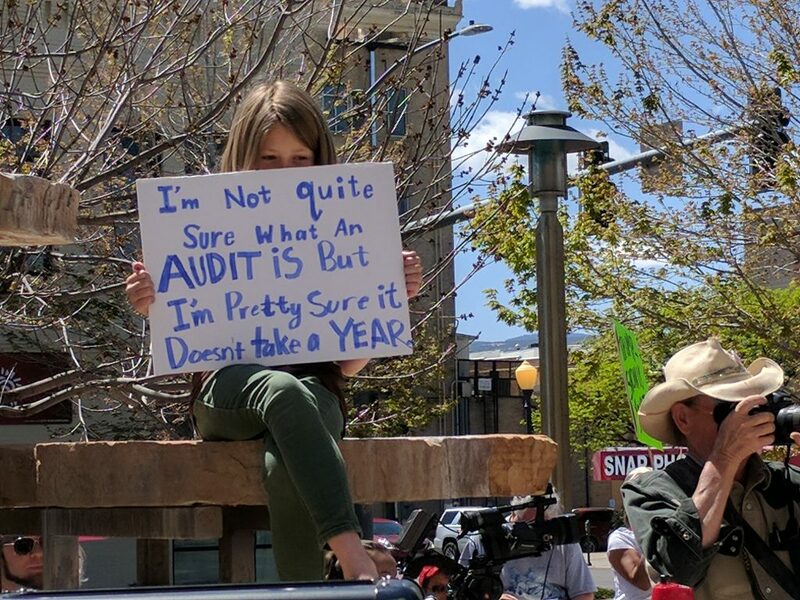 While some stayed home dying Easter eggs Saturday, almost 300 western slope citizens turned out for the national Tax March to demand Donald Trump make his tax returns public. Marchers gathered at Grand Junction City Hall and listened to speeches before starting off on a figure 8-shaped route through downtown that took them along Main Street, Grand Avenue and by the Post Office, where they mailed post cards to Trump saying they want him to release his taxes. On January 11, 2017, Trump dismissed the idea that voters were interested in his tax returns, claiming the only people who care about his tax returns are members of the media. But he was proved badly wrong when on April 15, thousands of people in hundreds of cities across across the country took to the streets to demand he make his taxes public. An ABC News/Washington Post poll (pdf) released on January 16,2017 showed 74% of Americans want to see Trump’s returns. He Won’t Show Them. People Are Suspicious Why. Trump is the first American president in modern history to refuse to release his returns. Judging by the signs seen in marches across the country, many Americans believe Trump is hiding his taxes because they reveal financial links to hostile foreign governments like Russia and China. In fact, just today the UK Independent published an article titled “‘Concrete evidence of collusion between Trump team and Russia’ handed to official investigation,” which says that there is now “specific, concrete and corroborative evidence of collusion” between people in Donald Trump’s presidential campaign and Russian agents regarding the use of hacked material. Anti-Trump protests in Grand Junction have been some of the largest protests the western slope has ever seen, and today was no different. The weather could not have been better for a protest march in Grand Junction. The skies were clear, the sun was shining and the temperature was about 70 degrees. Several hundred people with signs packed the plaza in front of Grand Junction City Hall prior to the march. Meanwhile, four or five darkly-clad open-carry proponents wearing T-shirts said things like “Come and Take it!” stood sternly around the perimeter of the crowd, earpieces in their ears as though they were playing “Secret Service” and their arms folded sternly. 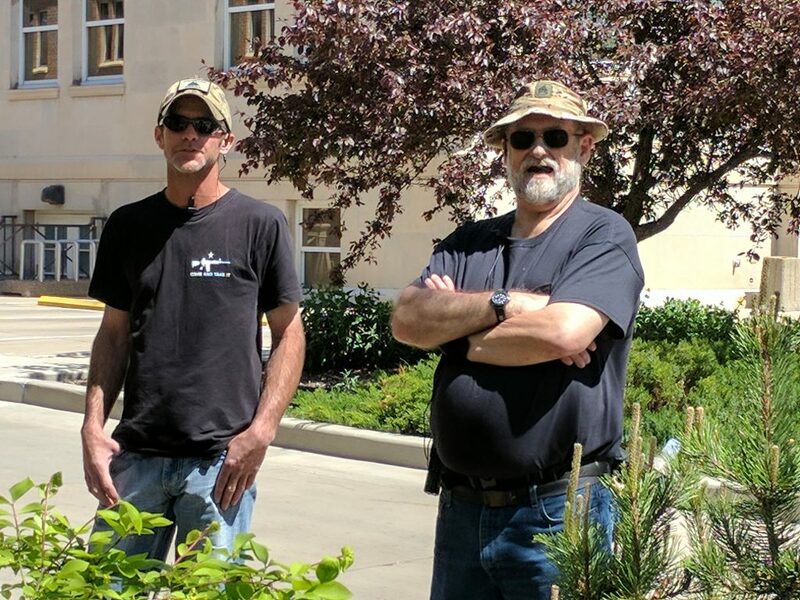 When asked their purpose for being there, they claimed it was “to protect the crowd.” They stalked marchers from across the street over their entire route and were stopped numerous times by the Grand Junction Police, who kept close tabs on them and asked to see their permits. Trump has claimed that he can’t release his taxes because he is being audited by the IRS, but there is no law barring people from releasing their own tax returns during an audit. See many more photos and videos of tax marches across the country at this link on Twitter. Open-carry dudes at the tax day march, playing Secret Service with earpieces. There is a rumor they were “Oathkeepers.” This is unverified. Close up of open-carry dude with “Secret-Service”- style earpiece stalking the march. Word is there were nine of them. ← How does Moab Feel about a “MOAB” Bomb Being Dropped on Afghanistan? Thank for your great coverage! It’s very nice to see so many concerned citizens coming together to express first amendment rights. And it was SUCH a gorgeous day! Those “men in black” have certainly not been trained to protect a crowd. By taking up compass positions and facing INTO the crowd, instead of facing OUT from the crowd, they could not possibly have identified a threat from outside. 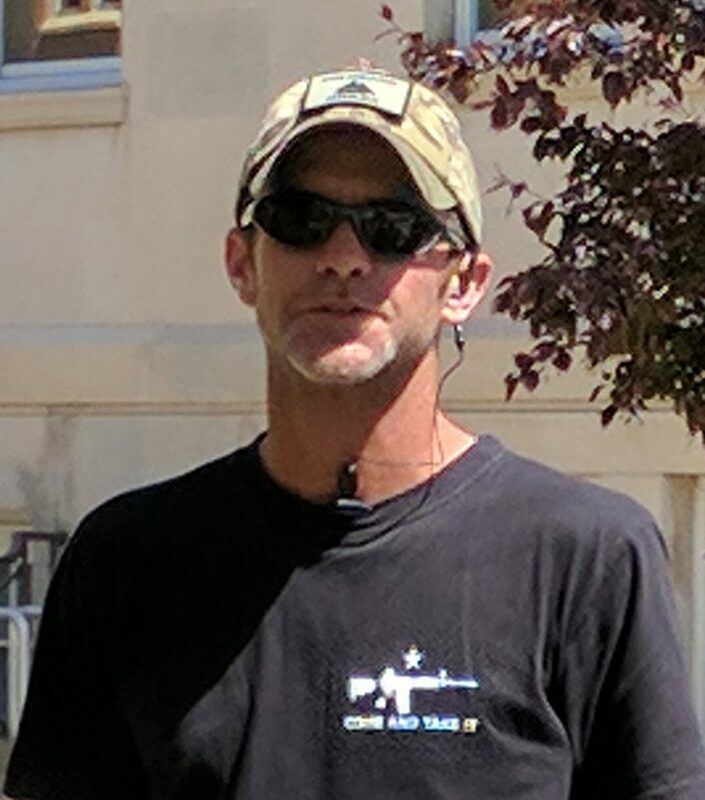 They certainly weren’t helpful, as they lied to GJPD about having informed the march organizers and also lied to people from the march about having informed the GJPD, they must just be wannabe Oath Keepers. Oath Keepers are known for their honesty. There were 9 of them by the way, and I hope that people who took photos of them will send them to Ann Landman’s blog. They all were parked in the east parking lot of the Methodist church where they convened to “debrief” after the event was over. Next time maybe people can bring GIANT signs to hold in front of them, so they’ll have to turn around and serve their purpose effectively, instead of menacing a group largely comprised of senior citizens, veterans, and children. Our PD is awesome and they do a great job of protecting our community, and helping to deal with creepy lurkers. Ah ha, so there it is. They weren’t oath keepers, they were Methodists. Probably that’s why they were facing inward. To protect the marchers from the Devil Worshipers that were mixed in with em. Thanks for the info.. I’m sharing. What a difference a real President makes. Two totally unrelated groups able to come together on the streets and exercise their Constitutional right of free speech….and their Constitutional right to keep and bear arms. Why it’s enough to give you hope that America is becoming great again. I would say that the big winner yesterday was the Constitution and the American way. And oh, by the way, this is an open carry state and unlike the Obama years, you don’t need a permit to exercise your liberty, except maybe a permit to parade. You guys should do this more often as a demonstration of democracy in action. Trump derangement doesn’t have to be a bad thing. As you can see, it’s bringing people out of the closet and on the streets already. And you know what they say about sunshine being the best disinfectant? And the earpieces, that’s a great idea. It helps people to communicate without bothering other folks, that may be near by. GJPD Thanked us for being there. They said since there was no permit applied for the March they did not schedule extra people to be down there. We were glad to help out. Our objective was to protect people’s rights to free speech. No one was open carry. We also had members who participated in the March. It was a very well put together and managed event. No conflicts like some of the other similar events we covered. Denver had some people who tried to make trouble. The West Slope can be proud that we have people who are adult enough to get along. Congrats on a successful event. We welcomed all people to come to the march. I hope the intent (Guys In Black Shirts) was not to intimidate our more senior marchers in the back of the group. If you feel that you were standing up for your rights, that was our intent in planning this march. I’m glad you did. I am a progressive and I support the second amendment, and constitution. Harold, thank you for your kind words about the Tax March. I think all of the peaceful citizens who stood for their rights made the march a success. 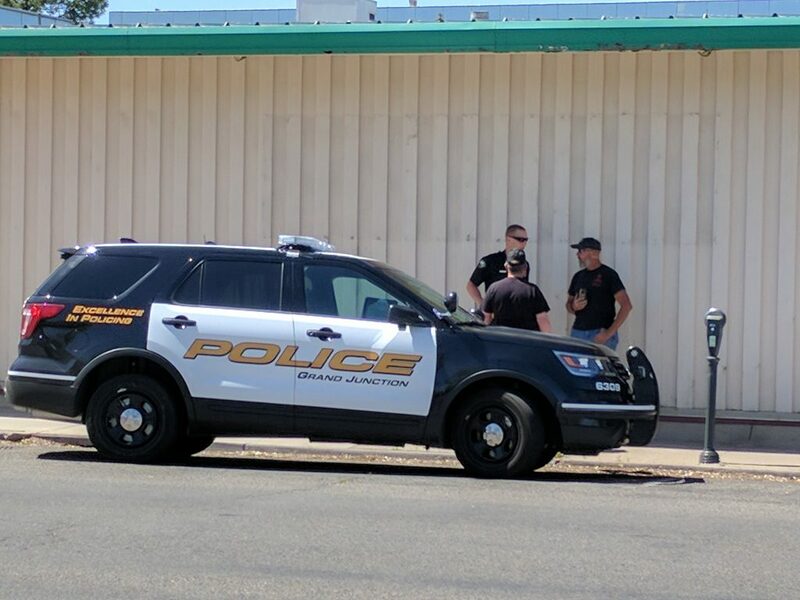 Thank you GJPD for keeping everyone safe. Great reporting Ann Landman! What about this: Next time there’s a March, approach the march organizers first (it’s easy to find them — they have the bullhorns) and ask them if your services are desired or needed. Then act accordingly. Without asking first, your presence will not be viewed favorably, as you have seen. It’s just common sense/courtesy. The last time I looked, courtesy was a two way street. But then, what would we know? As you all know, we’re irredeemable deplorables. Well, there it is. I did feel intimidated by your presence. Your calling yourself a “deplorable” hints at your purpose. The gun t-shirts, the camouflage truck, the following us and photographing us. Intimidating. And the lying to police and organizers. Why are you saying the police thanked you? They told me no one from your group approached them. I agree you did not open carry. The blogger did not say you did, a commenter did. I know your weapon that day was intimidation. How interesting that you would direct the indignation in your post toward me, personally. An assumption no doubt based on emotion, real or perceived. Obviously, you do not know me. 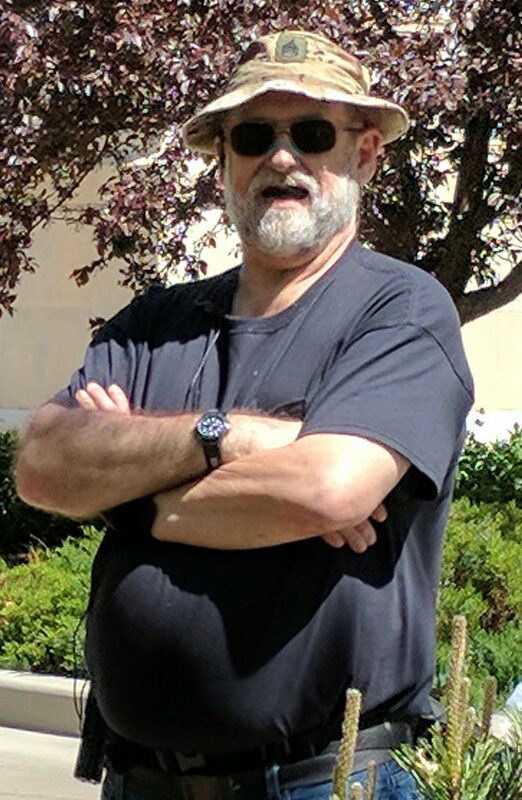 Equally obvious, if you had asked of Anne Landman or any one of dozens of others who participated in that march, (and know me), they could have told you that I was not there at the time of your perceived insult or intimidation. Fact is; I wasn’t there at all. And that is pretty much a confirmation of what I have long expected. We deplorables all look pretty much alike to you. Our opinions and observations hardly worth considering, or even acknowledging. In a world shaped to your liking, you seek safe space from the consequences of your own actions, and their lasting effects on the lives of other human beings. Tell me my friend, how do you justify that? Or do you (like in everything else) just assume justification? How could you have made that any more transparent? If you stay on the sidewalk, a permit isn’t needed. The organizers did work with the City on the event.